Welcome to this edition of our research round-up. This is a regular series featuring the most relevant most interesting brand new research in triathlon, its three disciplines, nutrition, and all other things related to triathlon (although I admit that sometimes I’ll just throw in a weird and funny study for a laugh). A Finnish study divided 29 runners into a high-intensity and a low-intensity group, and measured their baseline heart rate variability (HRV) to investigate whether it could help predict the runners’ response to the different training regimes. The duration of the study was 16 weeks, with 8 weeks of base training to establish the HRV baselines, and 8 weeks of group-specific training. Interestingly, they found that athletes with high HRV baseline responded better to high-intensity training, and runners with low HRV baseline responded better to low-intensity training. Training response in the different study arms. 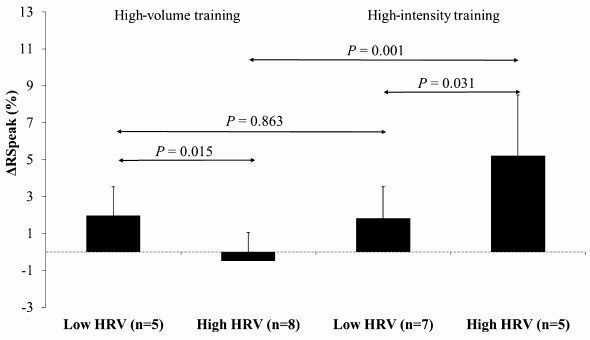 Low baseline HRV predicted a better response than high HRV to high-volume training, and high baseline HRV predicted a better response than low baseline HRV to high-intensity training. High-intensity training led to overall higher responses. Figure by Scandinavian Journal of Medicine & Science in Sports. Republished from Sweat Science. This is only a preliminary study, but it will be very interesting to see the results from follow-up studies. It could be a great push in a new research direction which tries to find predictors for training response instead of putting different training regimes against each other. This study compared 20 young (average age 28.5 years) and 20 masters (59.8 years) athletes. They used standard methods for determining run and bike efficiency; first incremental run and bike tests to find VO2max and the first ventilatory threshold (VT1), and then measured their expired ventilation rate during a separate VT1 test to determine efficiency. They found that cycling efficiency was 11.2% lower and running efficiency was 10.8% lower in the masters group. Generally speaking this is in line with previous findings, although it is interesting that cycling efficiency decreased as much as running efficiency, since at least anecdotal evidence indicates that cycling efficiency would decrease at a slower rate with age. This study from the Texas A&M University investigated whether consumption of powdered tart cherry during a 10-day period, from 7-day pre-race, through race day, and until 2 days post-race, affected race performance in a half marathon and post-race inflammation. 27 athletes were matched based on reported race pace, age, weight and fat percentage and randomly assigned to either the tart cherry group or a placebo group. The researchers reported both faster race-times and better post-race immune and inflammatory responses. In my opinion, with such a small sample of athletes, and matching based on as many as four different criteria, the results will likely be poor matching, so the faster times cannot by any stretch of the imagination be attributed to tart cherry. However, inflammatory and immune responses have been shown before to be positively impacted by tart cherry, so that one probably has some legs. This new publication is a literature review on the effect of sports drinks’ carbohydrate profile on endurance performance. Carbohydrate profile here means whether the sports drinks carbohydrate source was purely glucose/maltodextrin or a 0.5-1.0:1 ratio of fructose to glucose/maltodextrin. Based on the 14 articles included in the review, the authors concluded that statistically significant small to moderate enhancements were seen in 2.5-3h endurance performance when mixtures of fructose and glucose/maltodextrine were consumed compared to just glucose/maltodextrin. The differences were more pronounced when sports drink was consumed at a faster rate. This is really useful knowledge for triathletes, and with the amount of data this is based on, can be considered fairly reliable. So look for sports drinks with dual sources of carbs the next time you do your endurance nutrition shopping! This study from the University of Brisbane enrolled 30 athletes in a study with three groups; 90 minutes low/moderate intensity training (90CONT), 90 minutes low/moderate intensity training with post-workout cold-water immersion (90CWI), and 30 minutes high-intensity training with no cold-water immersion (30HIT). They assessed all athletes sleep quality during four nights of baseline, and then for five days with the same training but in hot conditions (90°F/32°C). The variables measured were time in and out of bed, sleep latency, efficiency, total time in bed and total time asleep, wake after sleep onset, number of awakenings, and wakening duration. Their findings showed significant differences between normal training and heat training (HT) on total time asleep (p = 0.01, time asleep reduced for HT) and the duration of periods of wakefulness after sleep onset (p = 0.001, increased for HT)). They also found sleep latency to be significantly higher for the 30HIT group compared to 90CONT. Cold-water immersion had no effect on any of the outcomes. With the rising popularity of heat training, this is a rather interesting study, and it was designed well-enough that the findings can be considered at least suggestive. That said, the sample size is still rather small, and we should wait for more results before umping to any definitive conclusions. Neural efficiency higher in higher-level athletes? In the final study in this research roundup edition, 29 athletes were divided into two groups based on their VO2max (high and low). Using EEG measurements, the neural efficiency (measured as alpha/beta ratio) at different sites of the brain was recorded both at rest and during a bike workout. The results revealed that neural efficiency was higher in the high vs. low group both at rest and during exercise. The authors suggest this may have to do with inhibition of task-irrelevant cognitive processes. Personally, I would take this with a grain of salt until there is more evidence. If the study would have shown that neural efficiency at rest was not different between the groups it would have been more believable. As it is, the question remains as for why this efficiency would be higher at rest based on VO2max, and it makes me want to see what the actual statistical power for these findings were before I would pay too much attention to it. There might be some other underlying reason at play here. As we know, correlation does not equal causality. Hope you enjoyed this edition of Triathlon research roundup. Don’t hesitate to ask for clarifications in the comments below, or shoot me an e-mail. Also, if you know of any interesting brand new research that you think should make the list in future editions, please tell me about it! Finally, if you find this post useful, take a second to share it. Thanks for reading!